I have spent the last few posts trying to estimate what firms need to generate as returns on investments, culminating in the cost of capital estimates in the last post. In this post, I will look at the other and perhaps more consequential part of the equation, by looking at what companies generate as profits and returns. Specifically, as I have in prior years, I will examine whether the returns generated by firms are higher than, roughly equal to or lower than their costs of capital, and in the process, answer one on the fundamental questions in investing. Does growth add or destroy value? What are you trying to value? If your focus is on just equity investors and you are either doing a DCF built around equity cash flows (Dividends or Free Cash Flow to Equity) or using an equity multiple (PE, Price to Sales or Price to Book), your focus will be on profits to equity investors, i.e,, net margin. In a DCF valuation built around pre-debt cash flows (FCFF) or if you are working with enterprise value multiples EV/FCFF, EV/EBITDA or EV/Sales), your focus will shift to income prior to interest expenses, leaving you with a choice between operating income and EBITDA multiples. What are you trying to measure? If you are attempting to compare production efficiency across firms, the gross margin is your best measure, because it looks at the profits you will generate, per unit sold, after you have covered the direct cost of production. If you are attempting to compare operating efficiency, at the business level, the operating margin is a better device. That is because for companies that have to spend substantially on sales, marketing and other structural operating costs, the operating income can be substantially lower than the gross income. The net margin is almost never a good measure of operating efficiency, simply because it is affected significantly by how you finance your business, with more debt leading to lower net profits and net margins. What are you selling? For better or worse, business people who are seeking your capital try to frame the profitability of their businesses by pointing to the profit margins. 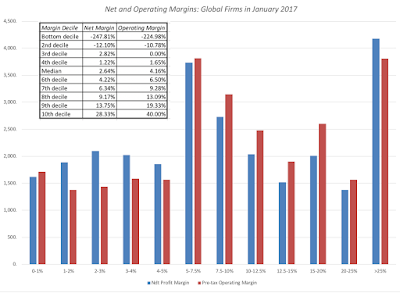 Since margins look better as you move up the income statement, business promoters are more inclined to use gross and EBITDA margins to make their cases than after-tax operating or net margins. 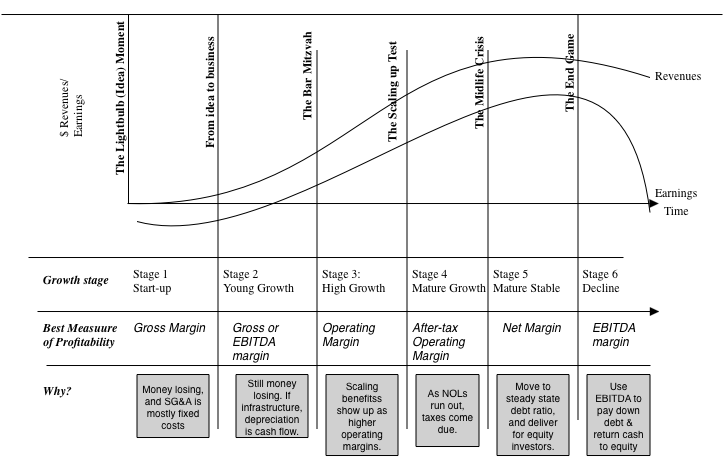 While that is perfectly understandable, and even justifiable, for a young company that is scaling up (see life cycle bullet above), it is a sign of desperation when companies continue to point to gross margins as their measures of profitability as they age. 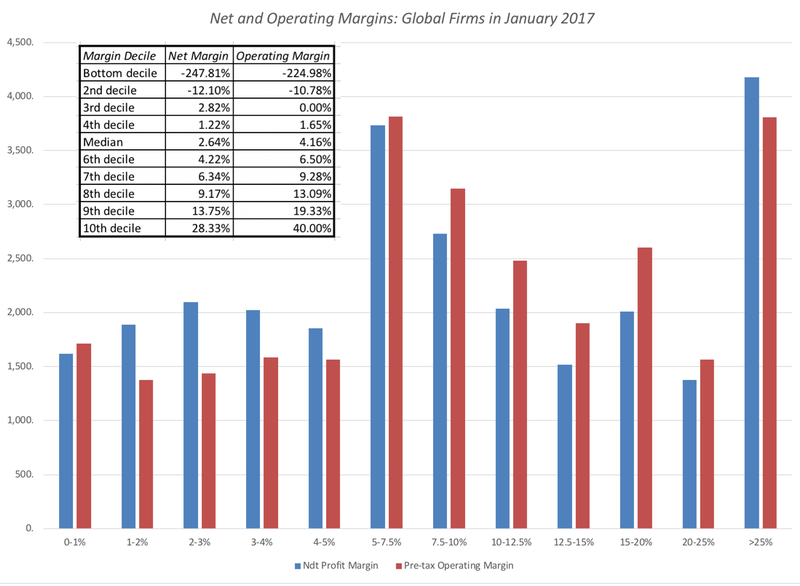 I find profit margins to be extraordinarily useful, when valuing companies, both for comparison purposes and as the basis for my forecasts for the future. If you look at almost every valuation that I have done on this blog or in my classes, a key input that drives my forecast of earnings in future years is a target margin (either operating or net). It is also the metric that lends itself well to converting stories to numbers, another obsession of mine. 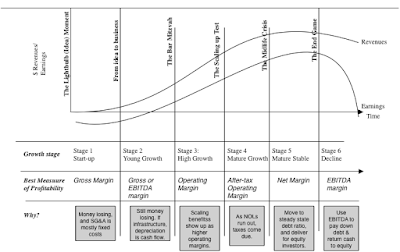 Thus, if your story is that your company will benefit from economies of scale, I reflect that story by letting its operating margins improve over time, and if your narrative is that of a company with a valuable brand name, I endow it with much higher operating margins than other companies in the sector, but there is one limitation of profit margins. If your focus is on answering the question of whether your company is a "good" or a "bad" company, looking at margins may not help very much. There are "low-margin" good companies, like Walmart, that make up for low margins with high sales turnover and "high-margin" bad companies, that invest a great deal and sell very little, with many high-end retailers and manufacturers falling into this grouping. It is to remedy these problems that I will turn to measuring profitability with accounting returns, in the next section. Unlike profit margins, where profits are scaled to revenues, accounting returns scale profits to invested capital. Here, while there are multiple measures that people use, there are only two consistent measures. The first is to scale net income to the equity invested in a company, measured usually by book value of equity, to estimate return on equity. The other is divide operating income, either pre-tax or post-tax, by the capital invested in a company, to estimate return on invested capital. While you will see both in user, there are two key factors that should color which one you focus on and how much to trust that number. Accounting Numbers: The first is that no matter how carefully you work with the numbers, the return on equity and return on capital are quintessentially accounting numbers, with both the numerator (earnings) and denominator (book value of equity or invested capital) being accounting numbers. Consequently, any accounting actions, no matter how well intentioned, will affect your return on invested capital. For instance, an accounting write off of a past investment will reduce book value of both equity and invested capital and increase your return on capital. If you want to delve into the details, my condolences, but you can read this really long, really boring paper that I have on measurement issues with the return on equity and capital. Note, that this is a comparison biased significantly towards finding good news, since by using a ten-average for the return on invested capital, I am reducing my sample to 14,502 survivor firms, more likely to be winners than losers. Even in this more optimistic picture, 2524 firms (30.2%) earn less than the cost of capital and have done so for a decade. Put simply, there are lots of companies that are bad companies, either because they are in bad businesses or because they are badly managed, and many of these companies have been bad for a long time. If there is a better reason for pushing for stronger corporate governance and more activist investors, I cannot think of it. As you digest the bad news in the cross section, if you are a manager or investor, you are probably already looking for reasons why your company or business is the exception. After all, excess returns can vary across parts of the world, different business or company size. It is in pursuit of that variation that I decided to look at excess returns, broken down on these dimensions. If you are holding out hope that your region is the exception to the rule, this table probably dispels that hope. One of the two regions of the world where companies earn more than their cost of capital is India, which the cynics will attribute to accounting game playing, but may also reflect the protection from competition that some sectors in India, especially retail and financial services, have been offered from foreign competition. The sobering note, though, is that as India opens these sheltered businesses up for competition, these excess returns will come under pressure and perhaps dissipate. It is interesting that the other part of the only other region of the world where companies earn more than their cost of capital is Eastern Europe and Russia, where competitive barriers to entry remain high. China, the other big market in terms of population, does not seem to offer the same positive excess returns, and that should be a cautionary note for those who tell the China story to justify sky high valuations for companies growing there. With US companies, the returns on capital reflect the effective tax rate paid last year (about 26%) and, if you hold all else constant, you should see an increase in the return on capital in 2018, a point I made in my post on taxes. Some of the sectors that fall into the bad business column did not surprise me, since they have been long standing members of this club. The automobile and shipbuilding businesses have been bad businesses,almost every year that I have looked at it for the last decade. Some of the sectors on this list will attribute their place on the list to macro concerns, with oil companies pointing to low oil prices. There are still others, though, that are recent entrants to this club, and represent the dark side of disruption, where their businesses have been altered by either technology or new entrants. The electronics business is one example, where margins have collapsed and returns have followed The telecommunications business, was for long a solid business, where big infrastructure investments were funded with debt, but the companies (whether they be phone or cable) were able to use their quasi or regulated monopoly status to pass those costs on to their customers, but it has now slipped into the bad business column, as technology has undercut its monopoly powers. 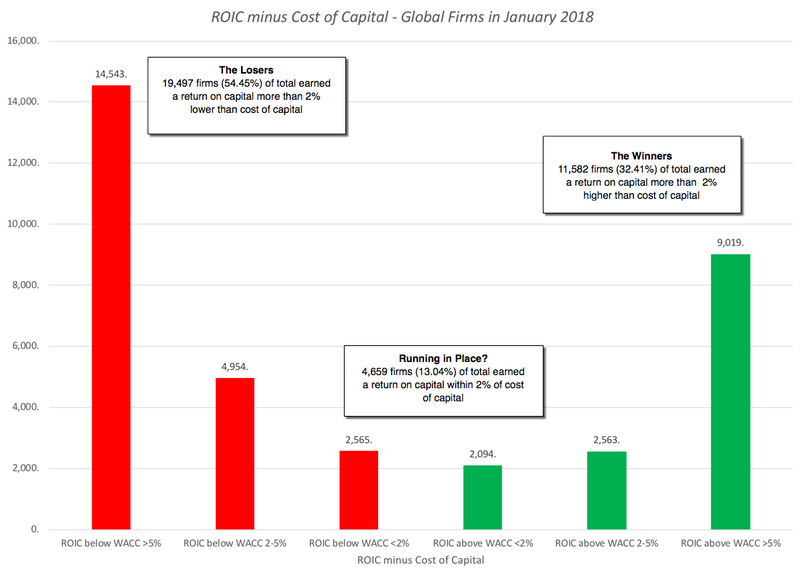 With financial service firms, where the excess returns are better measured by looking at the difference between ROE and cost of equity, the excess returns remain positive for the moment, but the future hold sthe terrifying prospect of unbridled competition from the fin tech startups. 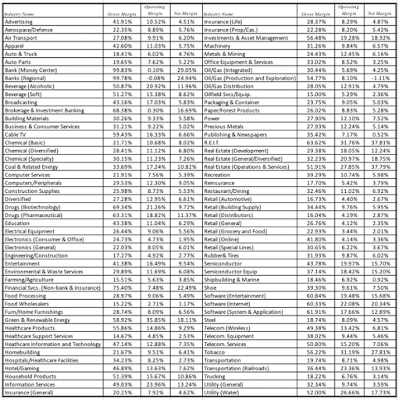 For proponents of small companies, the results in this table are depressing. Small companies constantly earn much more negative excess returns than large companies. 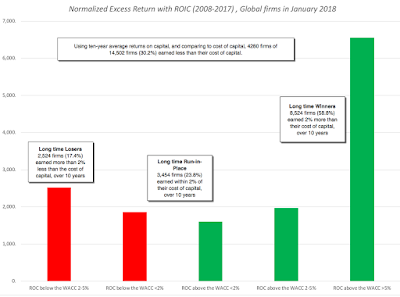 In fact, the largest companies earn positive excess returns, and while I am loath to make too much of one year's results, and recognize that there is some circularity in this table (since the companies with the highest excess returns should see their values go up the most), there is reason to believe that in more and more sectors, we are seeing winner-take-all games played out, where a few companies win, and find it easier to keep winning as they get larger. The Amazon phenomenon, which has so thoroughly upended the retail business, seems to be coming to other businesses as well. It also has implications for investing, and specifically for small cap investing, where investors have historically earned a return premium. The disappearance of this small cap premium, that I have pointed to in this post, may be a reflection of the changing business dynamics. There is a semblance of good news in this table. 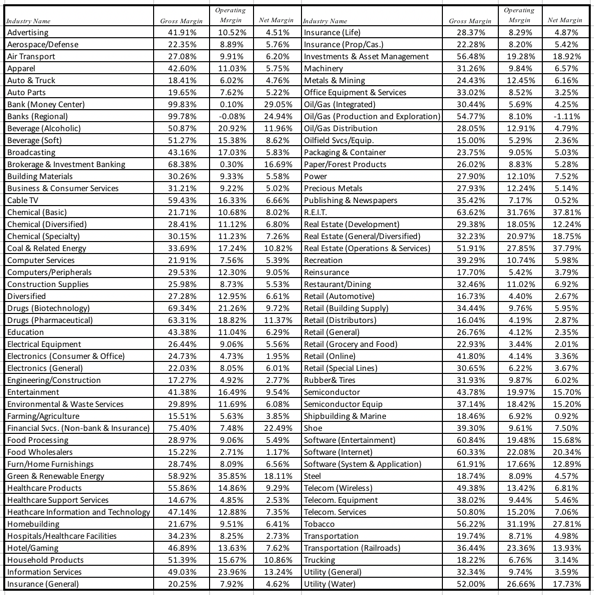 Companies in the highest growth class have the most positive excess returns, but as you can see in the table, the results are mixed as you look at the other deciles. The excess returns, in deciles six through nine are about as negative as excess returns, in deciles two through five. It behooves us, as investors, to be wary of growth in companies. 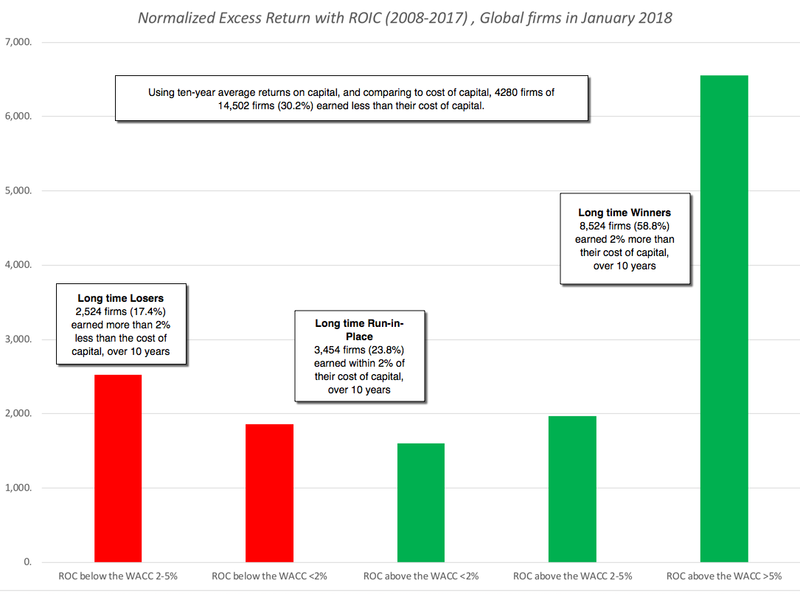 This post has extended way beyond what I initially planned, but the excess returns across companies are such a good window into so many of the phenomena that are convulsing companies today that I could not resist. Not only do the numbers here cast as a lie the notion that growth is always good, but they also let us see how disruption is changing businesses around the world. If there is a common theme, it is that change is now par for the course in almost every business and that inertia on the part of management can be devastating. As I look, in my next two posts, at how companies set debt ratios and decide how much to pay in dividends, where policy seems to be driven by inertia and me-toois, do keep this in mind. A great post! Thank for sharing your thoughts and analysis on growth and value of global companies - actually a topic, which is being highly debated in the context of digitization and the related consequences for the respective industries. I was surprised, that size (market cap) is still so significant in creating value according to your findings. Do you have an opinion how industries, which are importantly affected by (new) digital entrants do have a different behavior regarding excess returns - in both 1-year vs. 10-year time span? Is it possible to use the data sheet to calculate ROIC throughout a forecast period (e.g. calculate ROIC in Yr1, Yr2, Yr3...etc.). The financial statements would be created for the forecast period.